So easy even a monkey could do it! I’m visiting my sister, who does everything better than I do, not that I hold it against her or resent it in any way, even though our parents clearly loved her more and gave her better presents at every goddamned Christmas and birthday of our lives. So today she made a pie in the time it takes me to floss my teeth and even cleaned up after it on the same day, but again, no resentment here. I am big enough to share her triumphs, rather than being embittered by them, no matter how much I have suffered at her hands over the years. So, pies. 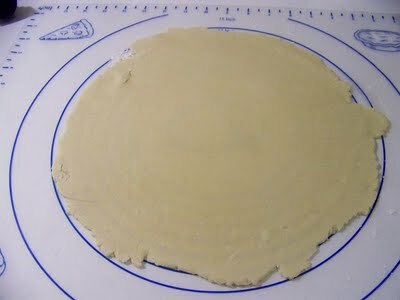 She uses one of these groovy plastic mats to roll out the dough. Not only does it tell you exactly how big the crust should be for every conceivable size pie plate, but it also saves you from cleaning up a big sticky, floury mess afterward. Or scraping the dried dough gobs and petrified flour remains off the counter with a butter knife once you emerge from the sugar coma eight hours after consuming the entire pie, a la mode, straight from the dish with a spoon. Not that Miss Perfect would ever do anything like that. I’m going to get one. And I am NOT copying her! Posted on January 4, 2012, in Baking, The easy way and tagged Baking and Confections, Drink and Food, Humor/Commentary, Pie, Pie crust. Bookmark the permalink. 5 Comments. Thanks for stopping! Once Martha’s minions get their souls back, I imagine they’ll never stop screaming…er, I mean talking. Your sister is better than me at everything. She keeps me motivated to do better. How many people have a personal consultant like we do. Personal consultant or drill sergeant? Which of these things? Not that I resent it of course. I’m the youngest of 4 sisters….I never get it right myself! Except for pie and not fruti pie but pizza pie! Hey we all have our hidden talents. Cold in Brooklyn…..thanks for making me forget the cold!